Mizuno MX 200 Y Tune Irons 4- PW (Right Handed) - used but in good condition Shafts: True Temper Dynalite Gold XP R300 - great condition Grips: Golf Pride MCC Plus 4 - excellent condition only re-gripped last summer Delivery via Royal Mail Signed For or collect in person. Any questions or for further picture please ask. Ping G700 6 And 5 Iron. Condition is Used, but this only for a few rounds in A1 condition. Lie is Green dot. Golf pride grip. UST Mamiya smac wrap recoil shaft 760/F2. Dispatched with eBay delivery – Shutl 1 day. Nike Vapor Fly Irons. 4-PW Regular steel shafts Irons are used but have been well looked after and are still in good condition. Fantastic game improvement irons. Any questions please ask. Taylormade Burner Tour Irons. Stiff Flex. Shafts : 7/10. Shaft bands/labels are worn but previous owner has stated they are stiff flex. 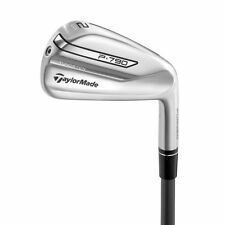 New listingTaylormade Tour Preferred MC Irons 4-pw KBS Tour Stiff Shafts +75"
Condition is Used. 3-PW (8 irons). Progressive blade set, so 3-7 iron are cavity back and 8-PW are blades. Taylormade P790 udi 2 iron KBS Tour stiff steel shafted driving iron. Only used a couple of times. Ping Zing Irons 3-SW. but is stiff shaft so there will be little difference in feel. The 7 iron has a light bump/indent which is actually under the grip so cant be seen, its very shallow, you can feel it if you run your hand down the grip, nothing that effects the performance of the club, its structurally sound and perfectly usable. PING G Crossover 3 Iron. This driving iron was sent back to PING to have it de-lofted by 1.5° so plays as a 2 iron. Great utility club, really easy to hit off the tee, the fairway or out of the rough. Selling as I hit it too far, pretty much the same distance as my three wood so my gapping is all wrong with it in the bag. Perfect club for a long daunting tee shot and really accurate. Shaft, grip, head and head cover all in really good condition. Can be collected from either London or Birmingham or posted to anywhere in the UK. Any questions please ask. Nike VR Forged Split Cavity Irons (4-PW). Stiff dynamic gold shafts with Nike grips. In used condition with reasonable blade condition. Collection from Abbotsley. Condition is Used see pictures as they are in excellent condition. Gap wedge is KBS tour shaft but still 90 gram. And 9 iron shaft was replaced with very similar shaft by my club pro but no sticker. Mizuno jpx 900 tour irons 4-PW. Clubs are in excellent condition and hardly used. Shaft is true temper xp115 s300. Clubs are half an inch longer and lie is 2 deg upright. Loft is standard. Any questions please ask, if I’ve forgotten anything. GRIP - Standard Black Mizuno. These irons are a second hand set of clubs and show slight signs of use on the face and sole of the golf club. These irons are standard loft and lie. These clubs have been used but not abused. Mizuno MX19 Hemi Cog golf irons, 3-PW (8No), RH, good condition. New to Palm Springs Golf are the incredible 2EZ iron sets. The 8 iron set composed of 4 iron through to pitch and sand wedge the 2EZ nano plated stainless steel irons are as performance enhancing as they are durable. Cleveland Launcher HB 5 Iron / Miyazaki Regular Flex. Titleist 503 H 19 Degree driving iron hybrid mens right hand regular steel flex. Condition is Used. Dispatched with eBay delivery – Shutl 2-3 days. TaylorMade Burner Plus Irons. 4 Iron to SW Reg Flex Steel Shafts. Some signs of use but good all round condition including grips. Please feel free to ask for more information. These irons are a second hand set of clubs and show slight signs of use on the face and sole of the golf club. These irons are standard loft and lie. SHAFT - KBS Tour Regular Flex. These clubs have been used but not abused. Ping Rapture Driving Iron (2 Iron)in very good condition. Shaft : Graphite (Ping TFC 949). Shaft Flex: Stiff. Original Actionlite 55 Graphite Shaft -. Original Lamkin Grip. Cleveland Altitude 588. Designed for mid to high handicappers with slower swing speeds, every 588 Altitude iron is engineered to get the ball up into the air easily for both playability and performance. PING G SERIES 3 IRON CROSSOVER. ALTA FLEX 70 GRAPHITE SHAFT. HEAD COVER. PING G SERIES 3 IRON CROSSOVER. ALTA FLEX GRAPHITE SHAFT. WITH HEAD COVER. Titeliest AP1 716 Irons 4-W Regular Shaft. Excellent condition with little signs of wear. Excellent condition grips. Standard lie and loft. MIZUNO MX 15 34579 sw irons steel shaft regular flex good condition. MIZUNO MP54 Irons 4-PW Stiff shafts.